Aurora Mountain Farm - Horse Power! This Freedom Ranger chick is about five weeks old. He has been living in the outside covered pen for just over a week now and has most of his adult feathers. You can see the yellow chick feathers still on his head, but the comb has already started to be more defined which lets us know that this chick is male. The Freedom Ranger has been bred to perform better than the standard commercial meat bird in free-range situations. There is a lot more genetic diversity in the breed and so they range in colour from pale grey to dark and from light blond to dark red. They are really beautiful with the variety of feather colouration. They also are much better at foraging. From the moment they first go outside, they are busy scratching in the dirt and chasing flying insects. Our pastured birds now originate with Couvoir Simetin in Mirabel, Quebec. Daniel and his team do a super job of ensuring these Sasso XL44 chicks arrive in great health. These birds are bred from a combination of several heritage breeds according to the Label Rouge standard in France and are very well suited to growing more slowly on pasture. When the chicks arrive, they must be shown how to drink and eat. As each chick is taken out of the box, their beaks are gently dipped in water until they've taken a drink. Then a little dip in the chick ration to let them know where to find it and they can be turned loose under the brooder. We use a propane brooder and wood shavings for bedding. The brooder must be turned on at least 12 hours before the chicks arrive so the bedding is at a nice, warm 30°C for their arrival. We keep our chicks on a non-medicated certified organic starter ration from Bradner Farms for the first week and a half, then switch to their certified organic broiler feed. While still in the brooder, the chicks get regular supplements of fresh greens (weeds) from the garden.This encourages them to spend more time foraging when they move outside and have access to pasture. 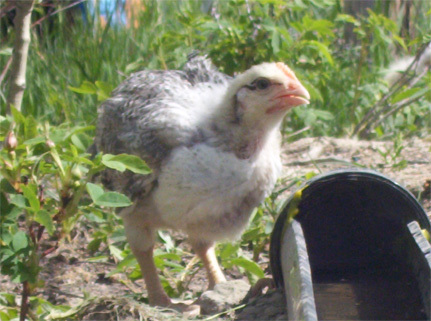 Pastured poultry are raised outside with access to grass. For us, this means the chickens are housed in portable pens that can be moved daily to ungrazed areas which not only provides fresh greens for the chickens but lets the chicken manure be spread over a wider area to maximize the benefits of the high-nitrogen manure while minimizing odours. Our birds live outside from about three and a half weeks of age until eleven to twelve weeks. 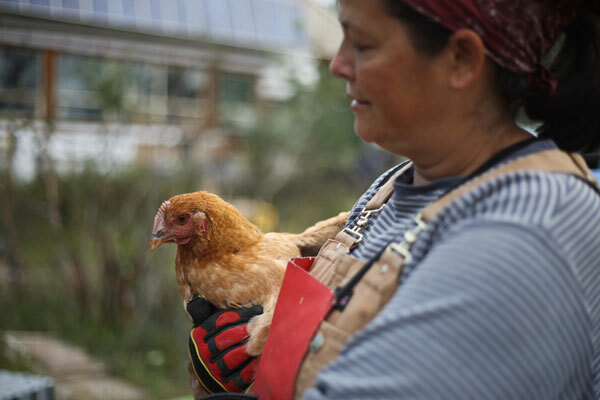 Several farmers who raise free-range birds in the Whitehorse area got together in the spring of 2007, obtained funding from the APF program and ordered chicken processing equipment to make the job of preparing birds for the freezer a lot easier. The group wrote a manual that describes the process and how to book the use of the mobile chicken processing equipment. In 2014, thanks to funding through Growing Forward 2, we upgraded to a larger scalder and plucker, added a Hotsy and generator, and installed it all on a flat deck trailer for easy setup. Contact Susan Ross (867-633-4201) to inquire about joining in on a processing day on another farm or about booking the use of this equipment on your farm.